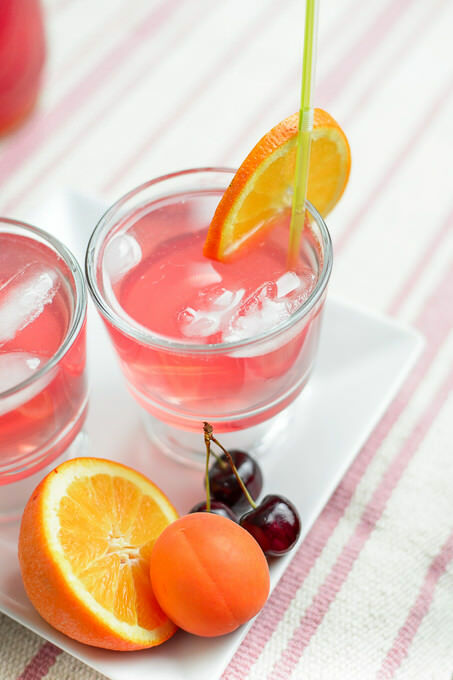 Kompot is a refreshing and satisfying thirst quencher, which will not make you feel guilty for indulging in a little sweetness. It is a close relative of fruit punch. 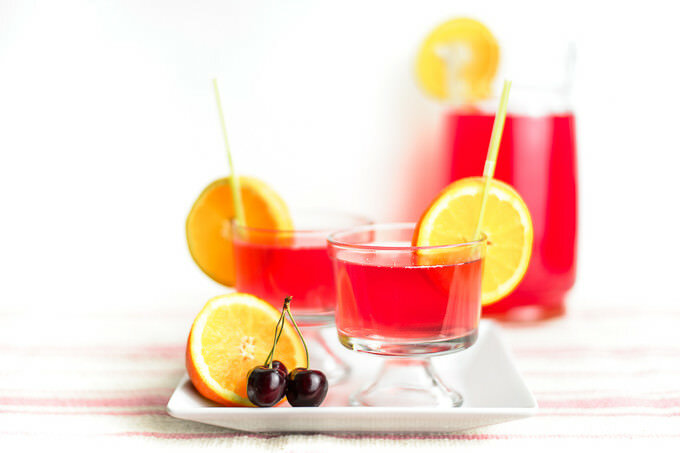 Precisely you can look at Kompot as an alcohol free, low sugar counterpart of the punch. For me kompot comes very handy when I have abundance of leftover fruits, which I hate to waste. I call it a Costco effect! I quickly turn them into kompot. If kompot is in the menu for the week, I know for a fact that my juice loving husband (however organic he might purchase) will reach out for kompot first, before considering other options. It also goes really well when you have guests coming over, and you want to offer them something you will feel good about. Kompot can be made out of wide variety of fruits. But some fruits complement each other better than others. I love grapes along with raspberries and some apples. Apricots go deliciously well with prunes or plums. Sour cherries (my favorite!) and apples make me want to bust out a happy dance in the kitchen floor! For this recipe I used cherries, apricots, couple of plums and apples. Some day I will be brave enough to preserve kompot like my mom used to. You will need a pretty large pot to boil kompot. 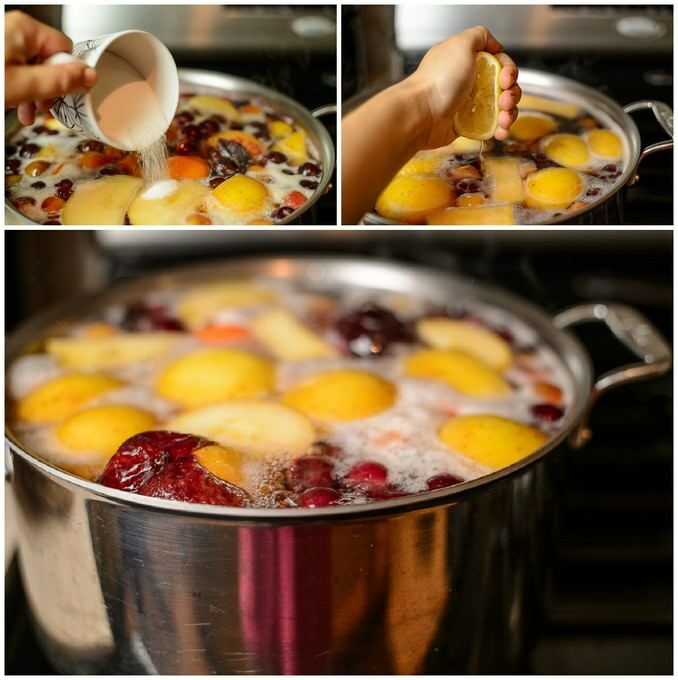 Place all the washed cherries, apricots, plums in to the pot. No pitting necessary! Cut up washed apples into any size pieces and add them to the rest of the fruits. Fill up the pot with water and start heating the pot on medium high. When the water starts boiling, turn the heat down to medium and let the kompot simmer for about 15 minutes. Add sugar, squeeze half of the lemon and simmer for another 5 minutes. Turn the heat off and cool at room temperature for about an hour. 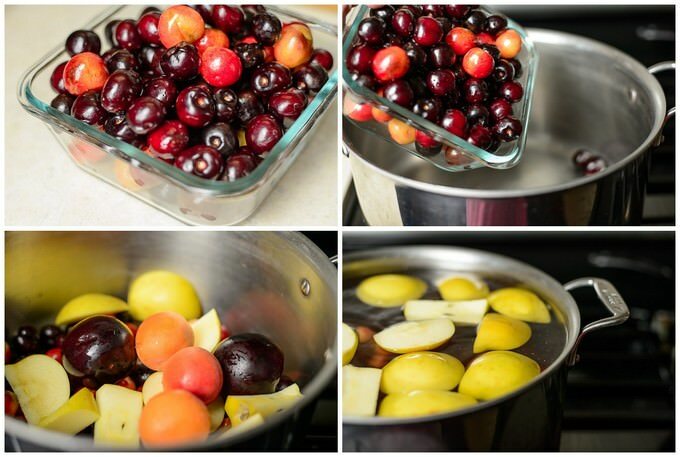 Using a strainer remove cooked fruits and separate the liquid into a different bowl or a pitcher. Keep refrigerated if the kompot is not being served. Refreshing and satisfying thirst quencher, which will not make you feel guilty for indulging in a little sweetness.